There are a number of reasons why having one or more 22 pistols makes sense. One is the price of ammo in the larger calibers. I’m regularly buying a box of 50 .22 cartridges at Walmart for $1.47. Lots of places are selling bulk price boxes at anywhere from 2 to 3 cents a round. In addition to the cost of ammo, there is the cost of the guns themselves. A lot of very nice 22s can be found for under $300. Then there’s the recoil. You can shoot a 22 all day without experiencing any consequences from recoil. I’ve written before about my 22 revolver history. I’ve recently discovered a couple more very nice revolvers and I have some favorite semi-automatics to tell you about. Let’s start with the revolvers. The first I want to mention is a cowboy gun, Uberti’s 10-shot Stallion 22. This is a beautiful gun with blued barrel and cylinder and case-hardened frame. It didn’t work right when I first got it, which seems to be unusual based on other reports I’ve read about this gun. Mine didn’t lock up properly. The problem was solved by ordering a new spring kit from VTI Gun Parts and replacing the block spring. The one that was in the gun was made from rounded wire. The one in the kit was flat spring steel. I don’t know why Uberti made the switch on the 22, but the generic spring for the .38 special and .22 versions solved the problem. This gun is dead on accurate up to 15 feet or so, which is as far out as I tried it, and fun to shoot. It’s also a very attractive gun. 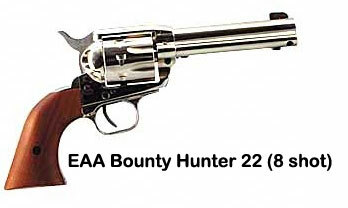 Next I want to tell you about the EAA Bounty Hunter 8-shot 22. This gun is made on the full-size frame of a SAA 45 Colt. It has a nickel finish and walnut grips. It also comes with a 22 Magnum cylinder, also 8-shot. I’ve only shot the 22 so far, but found that a pleasure. This revolver, too, is very accurate even with fixed iron sights. This is a gun that you could enjoy just holding and looking at. It’s also very reasonably priced with a retail around $250 or less. As far as semi-automatics go, I’ve had a Ruger Mark III for several years that is a joy to shoot for beginners and seasoned shooters alike. This particular gun has a bull barrel. It has a propensity for putting bullet holes one on top of the other wherever you point it. If that’s at the center of the bullseye, the gun will make you look like a really good shooter. It frequenlty makes first-time shooters in our NRA Basic Pistol Classes look good. Mine is pretty plain. I’ve seen some beautiful stainless steel examples with walnut grips, adjustable high-visibility sights, and a 6 & 7/8 inch barrel. 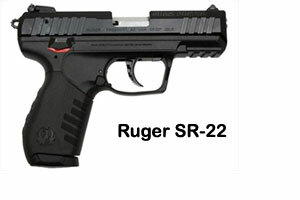 My other Ruger semi-automatic is an SR-22. 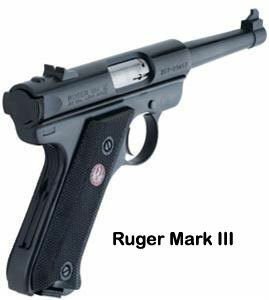 This is a recent introduction by Ruger that has been selling very well. We got on the allocation list from our wholesaler and were fortunate to get one a few months ago. We have since used it at some of our NRA classes and it’s a hit. What I like about it is that it will shoot almost any kind of ammo we feed it. Some semi-automatic 22s are not very forgiving in that area. The SR-22 comes with a small zip up pouch. You can literally stick the gun in the pouch, stick the pouch in your pocket and have a wonderful concealed handgun. Yes, it’s only a 22 and no you can’t draw it very fast from a zipped up pouch in your pocket, but it will allow you to carry a gun a lot of places you might not otherwise be able to carry one. It only weighs 17 ounces, holds 10 rounds and is accurate. My newest acquisition is a 22 caliber version of the Smith & Wesson M&P. The 22 is the same size as the 40 caliber M&P I carry every day. What a great and inexpensive way to practice! 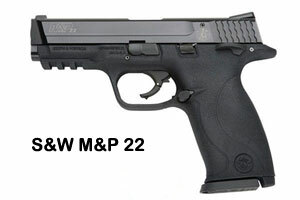 Smith & Wesson has done very well with their M&P line and this gun is no exception. It is made in Germany by Walther and operates differently than the larger caliber M&Ps, but from an appearance perspective, it’s hard to tell the difference. It has a 12-round magazine whereas most of the other 22 semi-automatics come with a 10-round magazine. This one came with a threaded barrel, so it’s just a matter of time before it will have a silencer attached. Look out squirrels! If you’ve been thinking about a cheap way to shoot a lot that’s also fun, there are a lot of options with 22 pistols. I grew up shooting one and for me they have never lost their charm. No, we don’t recommend them for self-defense, but we sure recommend them for practice and fun! I have a Browning Buckmark Camper .22 that is similar in style to the Ruger III. My original intent when I bought it was to have a handgun with as little kick as possible to teach my kids the basics of shooting. Now it’s one of my favorite guns. It really does make me look good at the range. I like shooting “Eye Holes” in my target. I almost always get at least one comment. Previous Previous post: I I Thought I Could Decide, But . . .
Next Next post: Air Gun Fun!